We love what we do and do it right. Global Autoworks is located in Grand Haven, Michigan and was established in 2013. Steve Metsker, along with his parents, founded the family-owned business for the purpose of providing premium import and domestic auto service to the Lakeshore area. Steve brought over ten years of industry experience to Global. His parents, Peter and Julie Metsker, added their experience running successful West Michigan businesses, including expertise in distribution and management that provided an insightful complement to the auto repair industry. Since then, we have become the preferred full-service auto repair resource for both import and domestic vehicles along the Lakeshore. Global Autoworks is a fully accredited automotive service facility specializing in both import and domestic vehicles. 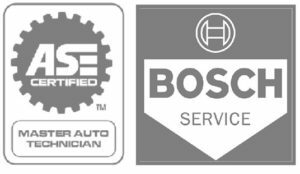 We are both ASE and Bosch certified. Mike Chan’s Bosch certification is a rare level of expertise awarded to fewer than 25 individuals in the State of Michigan. Take a quick tour of our facility and learn about our unique and comprehensive diagnostic services.